Mandala Airlines flight MDL 091, a Boeing 737-200 was to depart Medan-Polonia Airport (MES) for Jakarta-Soekarno-Hatta International Airport (CGK). The previous flight was from Jakarta and arrived at Medan uneventfully. The same crew have flight schedule on the same day and returned to Jakarta. At 09:52 local time, MDL 091 asked for push back and start up clearance. After receiving the approval the air traffic controller the crew began starting the engines. At 09:56, the controller cleared MDL 091 to taxi into position on runway 23 via taxiway Alpha. Six minutes later MDL 091 received clearance for take off with additional clearance from ATC to turn left heading 120° and maintain 1500 ft. The airplane failed to become airborne and overran runway 23, impacting several approach lights. It traveled through a grass area and over a river, and impacted several buildings and vehicles before coming to rest on a road. A post crash fire destroyed much of the airplane. One hundred passengers and crew members on board the plane died. Fifteen passengers seriously injured and two passengers (a mother and child) survived without any injuries. 49 persons on ground were killed and 26 people were seriously injured. Medan-Polonia has a single 2900 x 45 meters asphalt runway (05/23). - The aircraft took-off with improper take off configuration namely with retracted flaps and slats causing the aircraft failed to lift off. - Improper checklist procedure execution had lead to failure to identify the flap in retract position. - The aircraft’s take off warning horn was not heard on the CAM channel of the CVR. It is possible that the take-off configuration warning horn was not sounding. The National Transportation Safety Committee recommends that PT. Mandala Airlines ensure that flight crew correctly perform the checklist execution, in particular ensuring confirmation and verification. The National Transportation Safety Committee recommends that Mandala Airlines develop and promulgate an accurate checklist from the approved Operations Manual instead of the “do not use for flight” version. The National Transportation Safety Committee recommends that Mandala Airlines should review and update the Standard Operating Procedures in accordance with the approved Operations Manual. The National Transportation Safety Committee recommends that Mandala Airlines should conduct a functional test of the take-off warning horn on its Boeing 737 aircraft each day before commencing flight operations. Additionally the warning horn should be functionally checked once in every 200 flight hours in accordance with FAA AD 88-22-09. 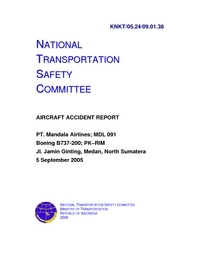 The National Transportation Safety Committee recommends that Directorate General Civil Aviation should enforce and ensure that the installation and the maintenance of FDR and CVR in accordance with CASR 121.343, 121.359 and Annex 6 Attachment D.
The National Transportation Safety Committee recommends that Directorate General Civil Aviation should assess the Mandala Airlines Operations Manual to ensure the adequacy of the Standard Operating Procedures. The National Transportation Safety Committee recommends that Directorate General Civil Aviation should review, and improve if necessary, the existing emergency manuals for airlines and airports, in particular with respect to coordination with local authority resources involved during emergencies. The National Transportation Safety Committee recommends that Directorate General Civil Aviation mandate the requirement for real-time exercise of Airport Emergency Plan to be conducted at least once every year. Distance from Medan-Polonia Airport to Jakarta-Soekarno-Hatta International Airport as the crow flies is 1388 km (867 miles).